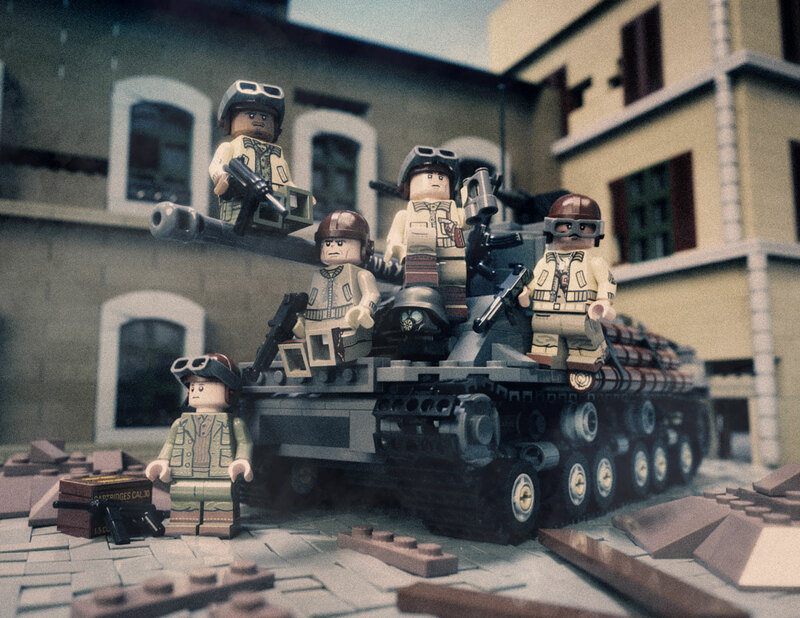 This add-on pack requires the Brickmania Easy Eight - M4A3E8 Sherman Tank kit. As the war came closer to its finale, Allied tank crews valiantly served the cause to defeat an increasingly stubborn German enemy determined to defend their home country. Armed for both armor and hand-to-hand combat, these crews were some of the most experienced and hardened soldiers the Allies deployed. This add-on pack for the Easy Eight Sherman kit (BKM2220) contains an entire crew and accessories ready for a Hollywood blockbuster of your own making. This add-on pack includes five custom-printed minifigures, 21 custom-printed elements featuring extra stowage and cargo, and a sticker sheet with authentic markings. It also includes an M1919 Machine gun, two M1A1 SMGs, two M3 “Grease Guns”, an M1873 Peacemaker, and an STG 44, all from BrickArms.